These vocabulary and verb form puzzles help students to review vocabulary and verb forms in the target language without resorting to the native language. I begin with a grid with numbers down the and letters across the top. Students are then given pictures that matched with each letter and the words for the pictures matched up the numbers. 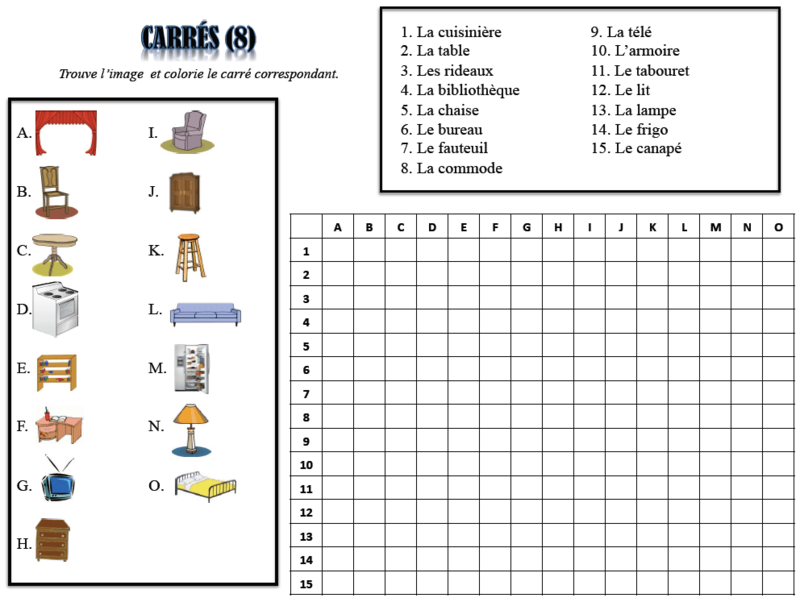 To complete the puzzles, students begin with a word from the number column and find the picture in the letter column. They then find the corresponding square in the grid and color it in (example: 1E, 5G, 7B etc.). This can also be done with subject pronouns and infinitives. The most challenging thing when creating these activities is to create patterns that are easily assessed by looking at the grid, keeping in mind that each row and column can only be used once. I also created verb form versions of these activities. You can see and download them by clicking on the links below. This entry was posted in Activities and Games, Classroom Procedures. Bookmark the permalink.